ISLAMABAD — A state-owned Chinese bank that had agreed to finance the Pakistani section of a gas pipeline from Iran that is opposed by the United States is no longer interested in the project, a Pakistani finance ministry spokesman said Wednesday. Finance Ministry spokesman Naveed Iqbal said he didn’t know why the Industrial and Commercial Bank of China was apparently backing out, but said “the geopolitical situation” had previously been cited by the petroleum ministry as the reason. The U.S. has warned Pakistan and companies assisting the project could face sanctions if they go ahead. Washington believes Iran is trying to develop a nuclear bomb, and wants to isolate Tehran economically to try and get it to abandon any nuclear plans. Iran says its nuclear program is for peaceful purposes. Iqbal said the Chinese bank and Pakistan’s Habib Bank Limited had jointly agreed to help finance the Pakistani section of the pipeline, but now seemed to “have no more interest in the project.” Neither company could immediately be reached for comment Wednesday. Pakistani leaders have vowed to press ahead with the pipeline despite U.S. opposition, saying it was vital for the supply of gas to the energy-starved country. But there have been widely expressed doubts over who will finance the project given U.S. opposition. “This is a fairly viable project and we hope and we will not see any problem in trying to find ways and means of ensuring its funding,” she said. Well ICBC shouldn't be held as a scapegoat.Its a foreign bank. Our own banks (govt. owned or otherwise) are not interested in this project as they don't want to be hit by US sanctions. The governments of both the countries should raise funds from the public directly via sukuk bonds/ conventional bonds (provided that they don't gobble up the funds for themselves). Obviously the govt. will require the services of an investment bank or a body that can help with the fund raising (an entity that can't be affected by any foreign sanctions). ISLAMABAD: Pakistan said Thursday it would seek Russian funding for a multi-billion dollar gas pipeline from Iran amid Chinese reluctance to invest in the project over fears it could be hit by sanctions. The quest for alternative sources of funds began when the Industrial and Commercial Bank of China (ICBC) failed to sign up to a consortium to finance Pakistan’s $1.5 billion share of the project. “Pakistan’s technical delegation will visit Moscow early next month to have discussions on this subject,” said foreign ministry spokesman Abdul Basit. The Pakistan team will hold talks with relevant officials and different companies, including Russian gas giant Gazprom, Basit said. A petroleum ministry official confirmed that Russia was a possible source of funding, given that there has still been no formal response from ICBC. The United States wants Islamabad to abandon the project because of sanctions against Iran over its nuclear programme, but Pakistan has insisted it is vital in helping to overcome a debilitating energy crisis. Pakistan and Iran signed a deal in 2010 in which Tehran would supply natural gas to its eastern neighbour from 2014, with sales to reach 750 million cubic feet to one billion cubic feet per day by mid-2015. Pakistan, which produces just 80 per cent of its own electricity needs, has presented the $7.5 billion gas project as a partial answer to the energy crisis, which has led to blackouts and has suffocated industry. I think it is a good move to get Russian involved in this project. The Gazprom guys are saying that give us the project without going into tender phase. I think it should be given to Russians, becauase A) they know how to build these pipelines B) they will build it regardles what yanks wants or not as they are pissed with yanks just like we are. We need to do what indians have been doing all along, to play both sides, we cannot have this yanks centric policy anymore. Surily bringing Russians in this will complicate things for the yanks. Although I blame the Pak governement for this screw-up I have serious doubts over Pak-China strategic partnership. All banks in China are Chinese govt controlled. So for a Chinese bank to chicken out means the Chinese governement has chickened out. Just imagine these Chinese running away when the situation is 100 times worse, like a war with India!! Pakistan really needs to re-think its cooperation with China. We have always been good allies with the US, no need to take risks for the Chinese. Its China that needs Pakistan, not the other way around. If Pakistan goes into the US camp China will be completely encircled from the the South, not to mention that it is encircled from the East minus North Korea). The bottom-line is that we are undergoing this terrible energy crisis. I see Iran-Pakistan gas pipeline as the short-term solution to this problem. We already know how Dr. Smar Mubarak and Thar-coal gas project were eulogized but all the castles built in sky get destroyed when we see the progress. So should we wait for year 2017 to come or should we at least go for the pipeline which can be completed by 2014 IF Pakistan does its part. Iran has almost completed its part of 1100 km pipeline while Pakistani authorities have not awarded the construction contract to any company. And lets not forget that one of the clauses of the agreements binds the two countries liable to pay 200 million dollars penalty per month after 2014. Ever increasing energy needs have compelled India to rejoin the transnational pipeline emanating from Iran and transiting Pakistan thus reviving IPI Gas Project, Online learnt on Sunday. A well-placed Indian diplomat told Online that his government was actively contemplating to look back on the option of IPI. He claimed that India had never abandoned the project, officially. “It was just gone down on the priority list mainly due to security concerns in Pakistan,” he added. Earlier India had practically abandoned Iran-Pakistan-India Gas Pipeline project for obvious reasons of entering into a nuclear deal with US. After India disembarked the trilateral mechanism for IPI, the pipeline was naturally left as only Iran-Pakistan (IP) gas pipeline. According to the diplomat, the announcement to give effect to the rejuvenation of IPI was expected during Prime Minister Manmohan Singh’s visit to Pakistan in the near future. Premier Singh had accepted President Asif Ali Zardari’s invitation on Sunday to visit Pakistan on mutually convenient dates. “We are an energy-deficient country and to sustain our high growth rate and ensure energy security, we need energy from every possible source,” the diplomat observed. A Pakistani official privy to the Iran-Pakistan Gas Pipeline project pointed out that the latest Indian overtures on IPI could be just bluffs again to appease Iran. Iranians have realized that India went out of IPI due to the pressure from US and was anxiously pursuing the American backed Turkmenistan-Afghanistan-Pakistan-India (TAPI) project. Iran has also gone on record saying that it was no longer holding talks with India on IPI pipeline but has signed a bilateral accord with Pakistan on the project. Under the deal finalized in March last year, Iran will supply 750 million cubic feet of gas daily to Pakistan by 2014. Indian diplomats however tried to dispel the impression that Washington had been exerting pressure on India not to pursue the IPI pipeline project in view of Iran’s controversial nuclear programme. Important issues concerning the IPI project, such as gas pricing, delivery point of gas, project structure, transportation tariff payment, transit fee for the passage of natural gas through Pakistan and security of supply, had still not been sorted out, he added. “Once our concerns are addressed satisfactorily, we will have no hesitation in going ahead with the project,” he maintained. ISLAMABAD: The Economic Coordination Committee (ECC) of the Cabinet has been informed that the participating countries in the Turkmenistan-Afghanistan-Pakistan-India (Tapi) gas pipeline project would sign the general sale purchase agreement (GSPA) on Monday, it was learnt on Friday. There is yet no agreement on the transit fee between Afghanistan, Pakistan and India. Sources said that the gas price formula approved by the ECC was based on base price, agreed risk sharing formula and gas price review mechanism. The gas price formula agreed with Turkmenistan was common for all buyers (Pakistan, India and Turkmenistan) in structure and only difference was the base price, which is different for all three buyers. The formula included a basket of fuels (Platts Oilgram Singapore Market) i.e. HSFO 380 cst, HSFO 180 cst and Gasoil to be used for indexation of the gas price. The agreed base price is 55% of Brent oil parity (at Brent price US$ 100/Bbl) and comes to 70% of Brent Oil Parity (at Brent price $100/barrel) in mid country - Multan delivered. The meeting was also presented a comparison of Multan Delivered prices of alternative fuels including HSFO, Gasoil, IP, RLNG and Tapi gas price demonstrating the economics of Tapi price vis-à-vis other fuels. An official said that complete cost of the project originally estimated at $3.3 billion in 2004 escalated to $7.6 billion in 2008. The ECC was informed that around four to five years would be required to complete the project after GSPA signing. The ECC was also informed that in view of different calculations of transportation and transit fee costs via the Afghan territory, Pakistan and Turkmenistan agreed to share the risk with a floor and ceiling of transportation and transit costs through Afghan territory. It was agreed, the ECC was informed, under Intergovernmental Agreement (IGA) and Gas Pipeline Framework Agreement (GPFA) signed on December, 11 2010, that Pakistan and India would negotiate and agree on transit fee with Afghanistan for their respective volumes. India would also negotiate and agree on transit fee with Pakistan as well as on flow of Indian volume through Pakistan territory. Minister for Water and Power Syed Naveed Qamar, heading a sub-committee of the ECC, submitted a report showing that Pakistan had held bilateral negotiations with India and Afghanistan. Pakistan-India-Afghanistan also held two trilateral meetings on the matter, the latest one held on February 23, 2012 on sidelines of Tapi 16 TWG meeting, The ECC was further informed. The Indian and Afghan positions were tendered during the meeting. The sub-committee was also briefed that though the transit fee matter was standalone from GSPA. However, TAPI parties had agreed to finalise the matter by April 20 this year. The sub-committee was also briefed that the Tapi parties had agreed that a suitable indexation mechanism would be incorporated in the transit fee agreement. The same was endorsed by the sub-committee. The Secretary Economic Affairs Division remarked that the transit figures, being negotiated between India and Afghanistan, were quite reasonable. It was briefed that while the transit fee was a zero sum for Pakistan and whatever transit fee number was agreed would serve as a benchmark for future gas agreements for Pakistan. Furthermore, in terms of value, higher transit fee would be beneficial for Pakistan. The sub-committee later approved the basis of the transit fee and negotiation of Tapi transit fee alongwith a suitable indexation mechanism. Top government officials express concern in ECC meeting. ISLAMABAD: After pulling out of the Iran-based gas pipeline project, top government officials fear that India might pull off a similar stunt with the $7.5 billion Turkmenistan-Afghanistan-Pakistan-India (TAPI) gas pipeline project. A few federal ministers expressed these concerns on Thursday in a meeting of the Economic Coordination Committee (ECC) of the cabinet, according to sources. India may pull out of the project just as it did with Iran-Pakistan-India (IPI) gas pipeline – now called just IP – after acquiring civil nuclear technology from the US. The top economic decision-making body ECC also directed the petroleum ministry to hold talks and clear out the uncertainty. “We have informed ECC that India is keen on TAPI gas pipeline project,” Petroleum Secretary Ijaz Chaudhry said adding that India’s involvement in TAPI gas pipeline project was discussed in the ECC meeting. Petroleum Minister Dr Asim Hussain also told the Express Tribune that ECC was informed that India was interested in TAPI gas pipeline project. Ministry of Petroleum moved a summary on Thursday seeking approval of the draft of Gas Sales Purchase Agreement (GSPA) for execution by Inter Gas Systems (Pvt) Ltd with Turkmenistan including gas price formula and gas price review mechanism. The pipeline initially aimed at bringing natural gas from Turkmenistan to Afghanistan, Pakistan and India. However, Afghanistan in February told Pakistan that it does not want gas supply from the project anymore and only transit fee for transportation of gas through its territory. As per the feasibility study, the design capacity of the pipeline is 3.2 billion cubic feet of natural gas per day. Petroleum ministry officials informed the ECC that capital cost of the project was originally estimated at $3.3 billion in 2004, however, fluctuation in steel and construction material till 2008 has more than doubled it to $7.6 billion. The project will take between four to five years to complete after signing of the Gas Sales Purchase Agreement. The Economic Coordination Committee approved gas sale purchase agreement for the US-backed gas pipeline on Thursday and endorsed the gas price at 70% of crude price, cheaper than the 78% parity to be purchased from Iran. With one agreement done, next round of talks will start on Monday in Islamabad between India, Afghanistan and Pakistan on the transit fee. Published in The Express Tribune, April 14th, 2012. ISLAMABAD: Pakistan, India and Afghanistan have agreed on the rate of transit fee on supply of gas from Turkmenistan through a transnational pipeline, popularly known as Turkmenistan-Afghanistan-Pakistan-India (TAPI) pipeline. This was the last major stumbling block before reaching a final agreement on the pipeline as Pakistan and India had already negotiated a gas price with Turkmenistan. Under the proposed arrangement, Pakistan will pay a transit fee of 50 cents per million cubic feet of gas per day (mmcfd) to Afghanistan and the same amount will be paid by India to Pakistan. A final agreement on the fee will be signed after Afghanistan, India and Pakistan get consent from their governments. During two days of talks that concluded here on Tuesday, Afghanistan demanded a transit fee of 54 cents per mmcfd whereas India offered 45 cents per mmcfd. “In the end, all countries agreed on the fee of 50 cents,” a senior government official said. Earlier, Afghanistan asked Pakistan and India to pay the fee in the form of gas but Pakistan opposed the proposal. In early February, Afghan and Pakistani officials had discussed three different proposals for the transit fee which included fee in cash or kind, a fixed fee in dollars on the volume of gas supplied or fee linked with per kilometre length of the pipeline. Petroleum Secretary Ijaz Chaudhry said Afghanistan and India would now seek the go-ahead from their governments for the fee. “If the three countries sign an agreement for the fee of 50 cents, India will pay over $600 million per annum to Pakistan, which will make onward payment to Afghanistan,” the official said. At the beginning of the project, Pakistan and India will receive 1.365 billion cubic feet of gas per day (bcfd) and Afghanistan will be supplied 0.5 bcfd. The Economic Coordination Committee (ECC) of the cabinet has already allowed the petroleum ministry to sign a gas sale and purchase agreement with Turkmenistan to push ahead with the $7.6 billion gas pipeline. The agreement is expected to be inked next month in Turkmenistan. However, the two sides will review the gas price every five years. Earlier, Pakistan proposed a price review every three years keeping in view the oil price movements while Turkmenistan wanted it to be fixed for 10 years. Published in The Express Tribune, April 18th, 2012. ISLAMABAD: Pakistan has issued tenders for the construction of 785 kilometres pipeline under Iran-Pakistan gas pipeline project and the successful bidder will be bound to complete the pipeline in 2 years. The tenders were issued after solid commitment from Tehran to extend $500 million credit line for the project, a senior official at the ministry of petroleum and natural resources told The News. Iran is desperate to sell gas to Pakistan, as it faces tough economic sanctions from the US and the Western countries over its nuclear programme. A consortium headed by the Industrial and Commercial Bank of China (ICBC) has already refused to provide financial advisory services for the project mainly because of the severe US opposition. As per the draft agreement for the contractor prepared by the Inter-State Gas Company, a copy of which is available with The News, the 785 kilometres long, 42-inch diameter pipeline will be laid in two years’ time to transport 750 million to 1 billion cubic feet gas per day at high pressure. The contractor will also install three pressure compressors in the pipeline from Pak-Iran border to Nawabshah. The official said the tax exemption on import of all items and services needed to help construct the pipeline would be extended. The interested companies will be bound to submit their technical and financial bids for the project by June 8. Under the gas sales purchase agreement (GSPA), the official said, Pakistan is bound to have a first take of Iranian gas by December 2014 and in case of failure, it will have to pay $1 million per day to Iran as penalty. That's absolutely brilliant news. Brother Simpleton, I'm really happy to read this news. Thank you posting it. Why doesn't Pakistan use its own expertise to build the pipeline? Aren't the Sui Gas pipelines built by Pakistani engineers or are the contracts for these handed over to foreign companies? Alternatively they could ask Iran to build the pipeline in Pakistan too. Also, I'm sure once the pipeline is fully built and pumping gas continuously to Pakistan, India would want to get back into the project. 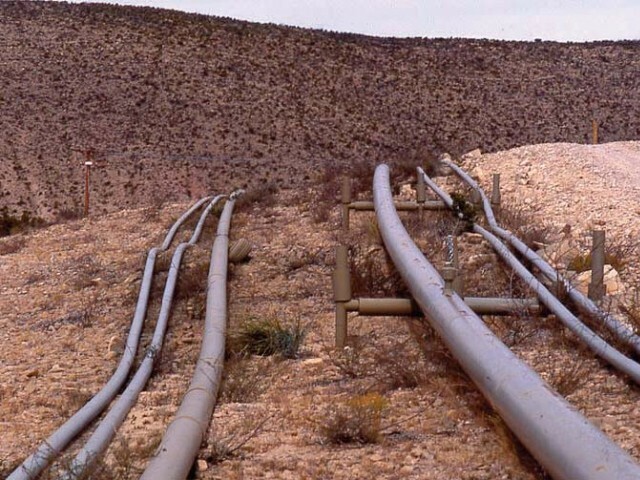 According to media reports, Saudi Arabia has approached Islamabad offering an energy aid package if Islamabad agrees to abandon the Iran-Pakistan gas pipeline project. Although the details of this offer are not available, it is an indication that the long-proposed Iran-Pakistan (IP) gas pipeline continues to stall. Although Pakistan is facing an imminent energy crisis, for Islamabad the project is caught up in the complexities of its relationships with Iran and the United States and now Saudi Arabia. Islamabad is of the view that securing funds for the construction of the Iran-Pakistan (IP) gas pipeline should not be a problem. According to media reports, addressing a joint press conference with the visiting Swedish Foreign Minister Carl Bildt, Pakistan's Foreign Minister Hina Rabbani Khar stated that there are multiple sources available. "This is a fairly viable project and we hope there will not be any problem in trying to find ways and means of ensuring its funding." She further stated that in keeping with the severity of the energy crisis in the country, "We cannot afford to be selective in pursuing energy sources and we will continue to do whatever we consider to be in our national interest." However, if recent developments are any indication, one can conclude that the IP gas pipeline is in trouble once again. The Iran-Pakistan pipeline, as it was initially planned, has been around for quite some time now. The discussions for it started in 1994 between Islamabad and Tehran. On the suggestion of Tehran, New Delhi was included in the proposed pipeline project and it became the Iran-Pakistan-India (IPI) pipeline. In February 1999, an agreement between Tehran and New Delhi was signed. The 1999 coup in Pakistan resulted in some delays, but it soon came back on track. According to various media sources, Tehran was also keen to involve China in the project. After India abandoned the IPI in 2009, after signing a civilian nuclear deal with the United States, the final destination of the pipeline remains unclear. Both Tehran and Islamabad, however, continued working on it. A gas purchase agreement between Iran and Pakistan was signed in 2009. According to reports, especially from Iranian sources, Tehran claims to have already completed its part of the pipeline while a feasibility study is underway on the Pakistani side. In recent times, Islamabad showed more inclination towards the IP pipeline than other options, including the Turkmenistan-Afghanistan-Pakistan-India pipeline (TAPI). This is for various reasons, such as the deteriorating Afghanistan-Pakistan relations, the uncertainty over Turkmenistan's ability to supply the agreed amount of gas, and the cost and duration involved in the completion of the pipeline. The last point being the most important, as Islamabad is in urgent need of new gas sources as it is increasingly running out of its own gas reserves. A number of experts have estimated that, even if demand does not increase, reserves would be completely depleted by 2028-30. Washington is strongly against the project. According to US policymakers, this would provide Tehran with capital, which it will use to pursue its anti-American, anti-Israeli and anti-western agenda and to further its nuclear programme. According to media reports, the US Secretary of State Hillary Clinton, addressing the House Appropriations Subcommittee on Foreign Operations, stated that embarking on the IP pipeline project is in violation of the Iran Sanctions Act. Although Islamabad has reiterated that it would go ahead with the IP pipeline, it would be a bumpy ride. Earlier this year, Pakistan's own Oil and Gas Development Corporation and the National Bank of Pakistan reportedly withdrew from the project, stating likely adverse implications for their foreign partnerships and businesses. But, if Pakistan does decide to back off from the project, it will have to pay a huge amount in compensation to Iran as per the 2009 agreement. The only encouraging note so far was that the Industrial and Commercial Bank of China was considering financing the project; however, recently different media sources have reported that it has decided not to. Another option is Gazprom, the Russian company, which has showed interest in the project. It would be some time before we finally know whether it will happen or not. While the IP pipeline project continues to face various serious hurdles and challenges, prime amongst them is how Islamabad will manage its complex relationship with both Tehran and Washington. The recent Saudi offer, while it would not solve any of the energy related problems, yet has added a new complicating factor into this already complex puzzle for Islamabad. What exactly the Saudis have offered and how exactly will it contribute in solving Pakistan's looming energy crisis? What effects will it have on Islamabad-Tehran and Islamabad-Riyadh relations? Islamabad has to keep this in mind while deciding its course. We, at the time of the writing of these lines, are not even sure of the choice of the timing and the motivation of the Saudis for their offer. In keeping with all the pieces of the puzzle, while Islamabad should go ahead with the IP pipeline feasibility study and see what shape the current crisis between the US and Iran takes, and what would be the outlook of post-elections Iran, it should also explore other possibilities, such as TAPI and/or a Qatar-Pakistan pipeline. However, Islamabad should not be the one to be accused of abandoning the pipeline project. IP's future depends on so many variables and only time will decide its fate. Islamabad has to take its decision based on its energy needs and also keep in mind that countries can't change their geography. ISLAMABAD: The government has authorized Interstate Gas Systems (ISGS) to execute the Turkmenistan-Afghanistan-Pakistan-India (TAPI) pipeline project's Gas Sale Purchase Agreement (GSPA) with Turkmenistan. It was decided in a meeting of the Sub-Committee of the Economic Coordination Committee (ECC) of the cabinet on the planned gas import projects, which was chaired by Minister for Petroleum Dr Asim Hussain here on Friday. The meeting called for early implementation of Tapi and Iran-Pakistan (IP) gas pipeline projects, directing the concerned quarters to make all-out efforts to complete the two dire needed pipeline projects to meet the rapidly increasing demand of energy. The committee expressed its satisfaction over the on-going progress on IP gas pipeline project and resolved to implement the project as per agreed timeline. The government has recently invited bids for constructing 785 kilometers of IP gas pipeline project from pre-qualified parties. The committee directed Ministry of Petroleum and ISGS to ensure all efforts for timely completion of the project. Officials told Business Recorder that a leading Russian gas exploration company, Gazprom, is the favorite to build and develop IP gas pipeline project that has already submitted Expression of Interest in response to Inter Sate Gas Company's invitation last year. Iran has assured Pakistan to provide $500 million funding for the Project and as per draft agreement Pakistan is bound to complete the project by the end of 2014 otherwise it will have to pay a daily penalty of $1 million to Iran. As per draft agreement of the project, the contractor will have to complete the project within two years 2012-14. The Government of Pakistan is expected to allow exemptions in duties and taxes on the import of certain materials required for gas import projects. EPC contractors are also expected to be exempted from sales tax for services provided on such projects. It was decided by the Steering Committee/Sub-Committee (SC) of the ECC and ECC of the Cabinet that a debt to equity ratio of 70:30 will be maintained with GoP having majority share in the equity portion of the project. The government has so far collected approximately Rs 35-40 billion from Gas Infrastructure Development Cess, which would be utilised for construction of IP gas pipeline and other energy projects. According to the Gas Infrastructure Development Cess Act the collected Cess would be utilised for or in connection with infrastructure development of the IP project, TAPI Pipeline Project, Liquefied Natural Gas (LNG) and other projects, or for price equalization of other imported alternative fuels including Liquefied Petroleum Gas (LPG). The meeting was also attended by Nawab Aslam Raisani, Chief Minister Balochistan, Hina Rabbani Khar, Minister for Foreign Affairs, Mir Changez Khan Jamali, Minister for Science and Technology, Ghous Bux Khan Mahar, Minster for Privatization, Makhdoom Shahab-ud-Din, Minister for Textile Industry and Dr Nadeem ul Haq, Deputy Chairman, Planning Commission among other members. ISLAMABAD: Russia on Wednesday agreed to finance the billion-dollar Iran-Pakistan (IP) gas pipeline as well as other gas and power import projects, while Pakistani authority would submit draft agreement for financial and construction assistance for IP within the next 15 days. The high profile meeting of Pak-Russia Joint Working Group (JWG) was held here at the Ministerial Secretariat, where a detailed negotiation over gas import as well as a number of energy projects took place between Pakistani and Russian authorities. Russian Deputy Minister for Energy YP Sentyurin led a 15-member delegation and assured of financial and technical assistance for IP gas pipeline project costing $1.5 billion. Sources in the Ministry of Petroleum and Natural Resources informed this scribe that Russian authorities agreed to provide assistance for IP gas pipeline and also expressed their consent to be a part of $7.6 billion Turkmenistan, Afghanistan, Pakistan and India (TAPI) gas pipeline project. He said that petroleum managers would prepare draft agreement of financial and technical assistance for IP gas pipeline project and submit it within 15 days, however Russian deputy minister didn’t pledge any physical assistance for the said project. Pakistani authorities expressed their consent to award contract to Russian companies without bidding as Russia agreed to finance gas and power import projects. In a preliminary meeting held in Islamabad on Tuesday, Russian authorities offered to extend cooperation in gas import through pipelines and Central Asia South Asia (CASA) electricity import project, which would bring electricity from Central Asian states. Tehran is also willing to provide financing of $250 million on government-to-government basis and can also extend a major part of financing from its commercial banks. Pakistan needs around $500 million to finance the pipeline. Russia also expressed its willingness to extend cooperation in Tetra-partner power import project under head of Central Asia-South Asia (CASA-1000), while other leading financial institutions including World Bank (WB) and Islamic Development Bank (IDB) made commitment of financial support for 1,000 megawatts (MW) power import project of Pakistan via Central Asian states. A cross-border transmission line project has been proposed for the construction of a dedicated link essentially aimed at supplying 1,300 MW of surplus hydropower available during the summer months from the Kyrgyz Republic and Tajikistan to Pakistan. Sources further informed that in the first phase this link would provide 1,000 MW power to Pakistan, but in the subsequent phases 5,000 MW to 6,000 MW power could be tapped from Central Asian countries to Pakistan, while Uzbekistan and Turkmenistan also offered Pakistan their intent to export surplus power to Pakistan. Under the CASA project floated in 2006, 1,000 MW to 1,300 MW of surplus electricity will be imported from Tajikistan and Kyrgyzstan, while United States, WB and IDB have also backed the project. Pakistan is also seeking China’s help to press ahead with the $1.5 billion IP gas pipeline. In a recent visit to Beijing, President Asif Ali Zardari and Adviser to PM on Petroleum Dr Asim Hussain succeeded in convincing the Chinese leadership to take part in bidding for the construction of the pipeline. Besides Russia and China, Iran has also come up with a plan to lay Pakistan’s portion of the pipeline based on a mechanism called ‘supplier’s credit’. Third meeting of Pak-Russia JWG would be held in Moscow in 2013. ISLAMABAD: Russian financing for two mega gas import projects including Iran-Pakistan (IP) and Turkmenistan-Afghanistan-Pakistan-India (TAPI) having accumulated cost of $9.2 billion entered in the second phase as energy managers on Thursday submitted complete details of the design and specification of both gas import projects to Russian authorities. The sources in the Ministry of Petroleum and Natural Resources informed this scribe that a high-profile Russian delegation led by Deputy Minister for Energy YP Sentyurin called on Adviser to the Prime Minister on Petroleum and Natural Resources Dr Asim Hussain. As expressing their keen interest to finance IP and TAPI gas import projects, Russian authorities demanded technical as well as design and specification details of both the billion-dollar projects, which later on the Ministry of Petroleum handed over to the guest delegation. He further said that Russian authorities assured Pakistani petroleum managers to came back with a financial model soon for financing of these projects after comprehensive homework of the Russian government and their companies, which later could be negotiate. Russia expressed its keen interest to finance particularly the $1.6 billion IP gas pipeline project, when Foreign Minister Hina Rabbani Khar was on a four-day visit to Moscow in February 2012, however Russian energy giant Gazprom linked this offer with awarding contract without bidding. The federal government is looking to increase its fuel imports from various sources, including Iran, to reduce power shortages that have crippled the country’s industry and shaved percentage points off its gross domestic product growth. The multi-billion-dollar gas pipeline aims to export a daily amount of 21.5 million cubic metres (or 7.8 billion cubic metres per year) of the Iranian natural gas to Pakistan. The maximum daily gas transfer capacity of the 56-inch pipeline, which runs over 900 kilometres of Iran’s soil from Asalouyeh in Bushehr province to the city of Iranshahr in Sistan and Balochistan province has been estimated at 110 million cubic metres. An official of the Petroleum Ministry on condition of anonymity informed that the Petroleum Ministry has been seeking full accumulated financing for IP-TAPI gas import projects, however federal minister kept flexible approach before Russian energy giants, adding two Russian energy giants Gazprom EP and PJSC Stroytransgaz. Pakistan, India and Afghanistan already agreed on rate of transit fee on supply of gas from Turkmenistan on rate of 49.5 cent per million British thermal unit (MMBTU), Petroleum Ministry claimed that gas import through this project would be cheap as compared to IP project and annually $1 billion would be saved. Under the agreement Afghanistan’s share would be 500 million cubic feet per day (mmcfd), Pakistan 1,325 mmcfd and India 1,325 mmcfd, 1,680 kilometres (kms) long TAPI gas pipeline backed by the Asian Development Bank will bring 3.2 billion cubic feet of natural gas per day (bcfd) from Turkmenistan’s gas fields to Multan and end at the northwestern Indian town of Fazilka. According to communiqué issued from Ministry of Petroleum and Natural Resources, Dr Hussain welcomed the interest shown by Russian Federation in TAPI and IP pipeline projects, and expressed confidence over the bilateral cooperation between Pakistan and Russian Federation. Petroleum secretary briefed the delegation on latest position of TAPI and IP pipeline projects, and emphasised on expanding the bilateral treaty framework of cooperation in oil and gas sector. It was agreed between the two sides that details of the two mega gas projects would be shared immediately and financial modalities would remain negotiable. Representatives of Russian companies including Gazprom EP and PJSC Stroytransgaz also briefed the Dr Hussain on possible expertise that could be provided for the TAPI and IP projects. It may be recalled that the 12-member Russian delegation is visiting Pakistan in connection with the second meeting of the Russian-Pakistani Joint Working Group on Energy Cooperation that is being held in Pakistan. ISLAMABAD: Iranian President Mahmoud Ahmadinejad Thursday vowed to complete a mutli-billion dollar gas pipeline to Pakistan on time, downplaying financial woes and US pressure on Islamabad to scrap the project. Pakistan and Iran signed a deal in 2010 under which Tehran would supply gas to its eastern neighbour from 2014, with sales to reach up to one billion cubic feet (28 million cubic metres) per day by mid-2015. The project envisaged a pipeline, 900 kilometres (560 miles) in length built from Assaluyeh in southern Iran to the border with Pakistan. Another 800 kilometres pipeline was also needed inside Pakistan to receive gas from Iran&rsquo;s South Pars field in the Gulf. &ldquo;We want to complete this project by 2014,&rdquo; Ahmadinejad told a press conference in Islamabad. &ldquo;The portion of pipeline on Iranian side is about to be completed swiftly, while on Pakistan side the work will be completed soon,&rdquo; he said, adding that Iran was also extending &ldquo;financial assistance&rdquo; to Pakistan for this purpose. He said Iran was also providing electricity to Pakistan and the two countries have signed agreements for up to 1000 megawatts of electricity supply. Ahmadinejad also brushed off US pressure on the gas supply project to Pakistan. &ldquo;America cannot affect this project&hellip;.God willing this project will be completed soon and gas will reach Pakistan.&rdquo; The plans to complete the pipeline in Pakistan have run into difficulty over reluctance by investors who fear they could be hit by sanctions. Pakistan insists the pipeline is vital to efforts in overcoming the energy crisis it faces, but the United States has expressed strong objections to the project. It is urging Islamabad to abandon it because of sanctions against Iran over its controversial nuclear programme. Pakistan, which produces just 80 per cent of its own electricity needs, sees the $7.5 billion gas project as a partial answer to the crisis which has led to blackouts and has suffocated industry. Iran, which has the world&rsquo;s second-largest gas reserves, is rapidly developing its production but can only export a small part of it due to lack of pipelines or liquefaction infrastructure. Edited by Shehz, 22 November 2012 - 11:12 PM. I'm really pleased to see this go through. We've got terrible relations with all our neighbours and it's a core part of the instability in our country. The Ayatollahs won't be in Iran forever, Pakistan and Iran will always be next door to each other. This deal will be 1 small step along that journey, it'll also help majorly with our energy needs. TEHRAN: Iran’s supreme leader Ayatollah Ali Khamenei on Wednesday told the visiting Pakistani president that a much-delayed $7.5 billion gas pipeline project must go ahead despite US opposition. “The Iran-Pakistan gas pipeline is an important example of Tehran-Islamabad cooperation, and despite hostilities towards the expansion of ties we must overcome this opposition decisively,” Khamenei told Asif Ali Zardari, his office reported. The gas pipeline project is strongly opposed by Tehran’s archfoe Washington. “Accessing safe energy source is the first priority for any country including Pakistan. In this region, the Islamic republic is the only nation that has safe energy resources and we are ready to provide Pakistan its energy needs,” the all-powerful Khamenei said. The pipeline project has run into repeated problems, including Pakistan’s difficulty in finding funds and opposition to the project from Washington, which has slapped Iran with a raft of sanctions over its nuclear activities. The Pakistani media reported last year that Zardari would visit Iran in mid-December 2012, when a final agreement was to have been signed, but the visit was delayed. In 2010, Iran and Pakistan agreed that Tehran would supply between 750 million cubic feet (21 million cubic metres) and one billion cubic feet per day of natural gas by mid-2015. Iranian President Mahmoud Ahmadinejad told Zardari that, “building the gas pipeline between Iran and Pakistan is a great and important event, and it serves the two nations’ interests,” the president’s office reported. “I believe that building this project is very beneficial for both sides and we support all the work carried out so far,” Zardari said in talks his Iranian counterpart. “The international and regional players have tried in vain to prevent an expansion of Iran-Pakistan ties but the people have learnt how to act against enemies of Islam,” he was quoted as saying. Islamabad has said it will pursue the project regardless of US pressure, saying the gas is needed to help Pakistan overcome its energy crisis that has led to debilitating blackouts and suffocated industry. Sanctions-hit Iran finally agreed to finance one third of the costs of laying the pipeline through Pakistani territory to Nawabshah, north of Karachi, with the work to be carried out by an Iranian company. Pakistani officials in mid-December said Iran had promised a $500 million loan and that Islamabad would meet the rest of the cost. “There are impediments in view of the US opposition to the project but we are determined to complete it to meet our fast-growing energy requirements,” said one government official on condition of anonymity. Tehran has been strangled by a Western oil embargo that has seen its crude exports halve in the past year, while Pakistan has an acute need for energy and plans to produce 20 per cent of its electricity from Iranian gas. Iran has the second largest world gas reserves after Russia and currently produces some 600 million cubic metres a day, almost all of which is consumed domestically due to lack of exports means. The only foreign client is Turkey, which buys about 30 million cubic metres of gas a day. Tehran also plans to sell its gas to two other neighbours, Iraq and Syria. The three countries agreed in 2011 to build a pipeline, with the work already started on the Iranian side. LAHORE Dunya News): President Asif Ali Zardari has said that the world should realize our national interests. “We need cheaper energy and Pak-Iran pipeline is our basic requirement in order to overcome energy crisis which has pushed the country on the abyss of destruction”, said president. He was speaking after inaugurating three separate projects in Lahore Monday including Prem Nagar Dry Port project of Railways and Allai Khwar and Jinnah Hydro power projects. Federal Railways Minister Ghulam Ahmed Bilour and State Minister for Water and Power Tasneem Qureshi, several parliamentarians and ambassadors of different countries were also present. He said that the work on Pak-Iran gas pipeline would be kicked off on March 11. He said that the preliminary review report of the project had been prepared in 1994. The President said that new incoming government would take advantage of its geographical importance in collaboration with international friends and the project would be completed with full potential. “We increased the expenditure on financial framework by 10 percent but it should be raised by 100 percent for the progress and prosperity of the country. The President said that it is not the government’s job to carry out trade; rather it can only facilitate the private sector. With the inception of Prem Nagar Dry Port, the economic activity of the country would be flourished where state of art services have been provided to importers and exporters. He said that country earned 280.07 million as profit from the project so far. The port has been constructed at 100 hectors of land. He said that Railways is working with private sector to play its role in national economy. Those days when china could openly use their army to pressure india are gone. This is not that climate anymore. But the reason why chinese bank pulled out is not them but us. We are not reliable. First news to the signing of deal came in 2010 and since then we didnt do jack about it. Banks wont give money to any project that can get delayed and cancel whenever US wants. Next week Iran and Pakistan will begin work on a $7.5 billion gas pipeline that the US has been fighting tooth and nail to stop in all manner of proxy methods. On 11 March, Pakistani officials braved the &ldquo;international community&rdquo; by announcing that &ldquo;groundbreaking&rdquo; work on the 780-kilometer pipeline would begin on the Pakistani side of the border, marking the start of construction by an Iranian-Pakistani consortium. Just prior to the announcement, Pakistani President Asif Ali Zardari met with Iranian President Mahmoud Ahmadinejad and Supreme Leader Ayatollah Ali Khamenei in Tehran. The Pakistani portion of the pipeline will cost around $1.5 billion. This is the key here because the 900-kilometer Iranian portion of the pipeline is already nearing completion. The pipeline will go ahead largely because Pakistan&rsquo;s energy crisis dictates that it must. And even US sanctions won&rsquo;t prevent it, and threats emanating from Washington (largely through the US mainstream media) are only working to increase already volatile anti-American sentiment in Pakistan. The US State Department has warned of sanctions, but is keeping a low profile on direct threats until the pipeline deal is sealed. It&rsquo;s still working the back rooms to stop the deal, but Iran is working even harder&mdash;namely by putting up the bulk of the funding for the Pakistani portion of the pipeline. So far, while the US has promised to offer Pakistan a better deal than a pipeline with Iran, we haven&rsquo;t seen anything concrete that can compete with this type of energy security. After all, the pipeline will bring Pakistan some 21.5 million cubic meters of gas a day. The US had been hoping to lure Pakistani into an alternative pipeline deal &ndash; the Turkmenistan-Afghanistan-Pakistan-India (TAPI) pipeline, which would bypass Iran. The TAPI pipeline, however, is a stop-and-start project that has its own security issues to deal with: it would be either targeted by the Taliban or the Taliban would have to be figured in as benefactors, which would mean much for the conflict in Afghanistan. Even the most optimistic observers put a completion date at around 2018. Washington remains adamant that the pipeline is a violation of sanctions on Iran over its nuclear program. But Islamabad is unmoved by the threats and President Zardari has intimated that the pipeline deal will go through despite external influence. "Nobody has the power to halt this project," he was quoted by The Express Tribune newspaper in Pakistan as saying. Of course, it&rsquo;s not an easy time for Zardari, whose five-year term is coming to an end, leaving open a window of opportunity for external influence in the election process to various ends. Pakistan's parliament is due to dissolve in two weeks in preparation for elections that will tentatively be held in mid-May. There are other ways to sabotage this pipeline as well. The pipeline runs through some extremely insecure territory in Balochistan, which is likely to become a new (old) frontline in regional pipeline wars in the immediate-medium-term future. The US and Saudi Arabia are willing to go quite far in derailing this project. They&rsquo;ve already succeeded to some extent. Originally, the pipeline was meant to include India and was dubbed the &ldquo;Peace Pipeline&rdquo;. Under pressure from Washington (plus a controversially generous gift of civilian nuclear technology access), India backed out in 2009. So with India out of the equation, all attention turned to another front to derail this pipeline&mdash;Balochistan. The US and Saudi Arabia are both fomenting separatism in Balochistan, which is a convenient venue for stirring up trouble. The Pakistani province has huge gas reserves and vast mineral resources, coupled with an ongoing, armed dispute between economically, culturally and socially marginalized Balochi nationalists who have serious grievances against Pakistan's Punjab-dominated federal government. Iran has a problem with Balochi separatists, the latter occasionally clashing with Iranian forces in Baloch-dominated regions across the border. The US is hoping that if the Balochis are empowered to step up the conflict, Iran could be forced to back down from its pipeline plans in light of the security situation. So far, this proxy war in Balochistan has been a major hindrance to Iran, but the end result is that it has only further inspired the pipeline plans. WASHINGTON: A US law, that the State Department says can be used against Pakistan if it finalises the gas pipeline deal, forbids any major investment in Iran’s energy sector. Sanctions established under this Act are in addition to any sanctions already imposed under the Iran Sanctions Act of 1996. The 2010 act establishes additional sanctions prohibiting specified foreign exchange, banking, and property transactions. The 2010 Act extended US economic sanctions placed on Iran under the Iran Sanctions Act of 1996 and punishes companies and individuals who aid Iran’s petroleum sector. It is part of a larger US campaign to target the Iranian petroleum industry with the aim to force Iran to abandon its nuclear programme. The act was passed by the House (408-8) and Senate (99-0) on June 24, 2010 and signed into law by President Barack Obama on July 1, 2010. As the US State Department spokesperson Victoria Nuland said on Monday, the act forced the European Union and Japan to drastically reduce their dependence on Iranian oil. In recent congressional debates, both Republican and Democratic lawmakers hoped the sanctions will soon force Iran to give up its nuclear programme. They also claimed that the sanctions had triggered such widespread discontent in Iran that the regime could be toppled in a popular revolt. An Israeli foreign minister document, leaked recently, reported that Iranian energy exports had fallen by 50 per cent after the European Union joined the United States last year in imposing an oil embargo on Iran. US officials and diplomatic sources in Washington say that allowing Pakistan to finalise the pipeline deal will reduce the impact of the sanctions by allowing Iran to export its gas. That’s why, they argue, Washington is opposing the deal. But a report posted on a popular US news site noted that the sanctions were hurting the Iranian people, not the government. The sanctions were making the Iranian currency “increasingly worthless,” the report added. The currency, Rial, has dropped 80 per cent in just the past year. “This was making it hard for Iranians to procure medicine from overseas. The price of an imported wheelchair has increased ten-fold in just a year. The price for a cancer patient to receive chemotherapy has nearly tripled, and filters for kidney dialysis are up by 325 per cent,” said the report while urging the United States to ease the sanctions. IRAN / CHAHBAR: The United States has made clear its strong stand against the Iran-Pakistan gas pipeline – but the first world power will perhaps be further irritated to hear that China is backing it with a $500 million loan to Pakistan. “In a major development, China has offered [the] loan,” an official at the Pakistan Embassy in Iran told The Express Tribune. The remaining $500 million would be generated through the Gas Infrastructure Development Cess from gas consumers. Pakistan had earlier planned to generate the billion dollars through the tax and Iran will be putting in $500 million. The geopolitical sands appear to be shifting on more than one front as this development comes days after Pakistan handed over to China control of its key Gwadar port in Balochistan. In one of the boldest snubs of consistent US pressure and warnings, Islamabad and Tehran formally launched the project on Monday in an elaborate groundbreaking ceremony held at the Pakistan-Iran border. Petroleum ministry officials confirmed that Pakistan is in the middle of procuring compressors and pipelines from a Chinese company and Iranian company Tadbir will do the construction. Pakistani companies such as Sui Northern Pipeline Limited, Sui Southern Gas Company Limited and Frontier Works Organisation would be involved. The board of directors at the Interstate Gas Systems met March 8 to consider awarding the contract for the pipelines and compressors to Chinese company Panyn Chu King Steel Limited that will provide the pipeline at the rate of $1,650 per tonne, including compressors. The board will be negotiating for discounts with the Chinese firm. Meanwhile, an Iranian company had quoted the price of $1,980 per tonne. An official said that Iranian contract prices would be turned down because they are higher. The 1,600-kilometre pipeline, projected to cost a whopping $1.5 billion would enable the export of 21.5 million cubic meters of Iranian natural gas to Pakistan daily. The country hopes to overcome its energy crisis with the 4,000 Megawatts capacity of this project. Iran plans to export 21 mln cubic meters gas per day to Pakistan. TEHRAN (Online) - Managing Director of National Iranian Gas Company (NIGC) Javad Oji said that Iran plans to export 21 million cubic meters gas per day initially to Pakistan via the peace pipeline. Talking to IRNA on the sidelines of a ceremony marking start of operation to pipe Iranian gas to Pakistan‚ he said Pakistanis favor increasing the ceiling of mutual contract to 30 million cubic meters per day. He said necessary predictions have been made for export of 60 million cubic meters Iranian gas to Pakistan through the peace pipeline. "So‚ their request to increase the volume of the gas exports to 30 million cubic meters from the current 21 million cubic meters will be studied." The official said Iran-Pakistan gas line is continuation of the 7th pipeline originating from Asaluyeh. He said the first phase of the 7th gas line‚ starting from Asaluyeh to Iranshahr in Sistan-Balochistan Province in an area of 900 kilometers‚ has been completed and people in the province are now benefiting from it. Oji pointed out that 80 km out of the 320 km pipeline‚ which lies in Iranian territory‚ has been completed. He noted that 780 km of the pipeline lies in Pakistani territory‚ costing 2 billion dollars to be implemented out of this $500 million of the piping cost has been financed by Iranian banks and companies‚ he added. He said that the project is commissioned fully by Iranian experts. It is estimated to be fully complete in December 2014. He noted that Iran can serve as sustainable supplier of energy to the neighbors as it has huge energy reserves.